CAF: Join the Air Force you never heard of…. Stephan Brown recently joined the Commemorative Air Force as its President/CEO. He outlines his new vision for the CAF and restates its goals for our readers. Kent Carlomagno is one of the most enthusiastic warbird operators you can meet. Each year he dedicates considerable effort to bringing together warbirds for a Veterans Day event. He continues to persevere despite weather problems during the last several events. 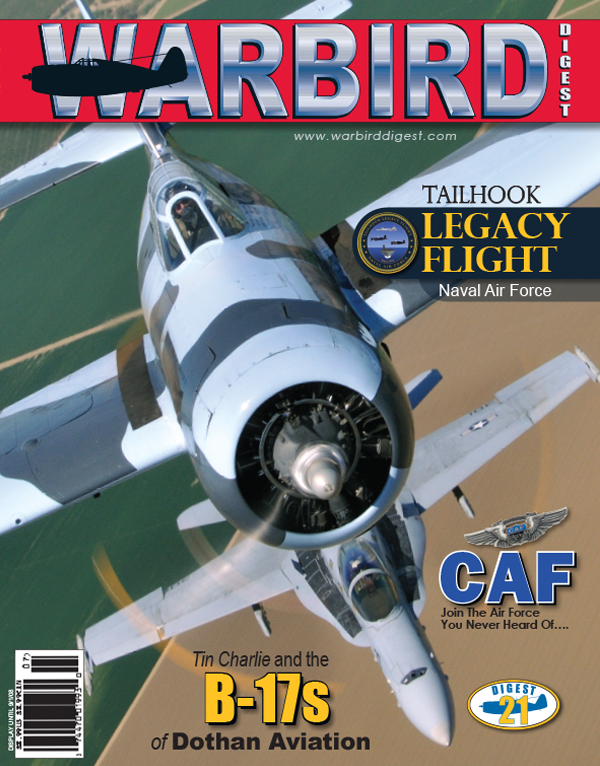 Frank Mormillo attended the most recent event and brings Warbird Digest readers the inside story. Frank Luke, a native of Arizona, has been honored by the state’s biggest City with a tribute at Sky Harbor International Airport. Warbird Digest’s Greg Morehead was recently invited to join members of the U.S. Navy Tailhook Legacy Flight for their annual spring ‘workup’ at NAS Leemore. Bob DeFord decided he wanted a Spitfire, and since it was beyond his economic means, he set about to build one from scratch. Scott Germain describes how he did it. In our continuing series, Doug Fisher presents a collection photographs that demonstrate that Warbirds were not always the highly desired historic objects that they are today. Scott Thompson takes a fascinating look back at Dothan Aviation and their fleet of B-17s that were used to combat fire ants across the southern United States.